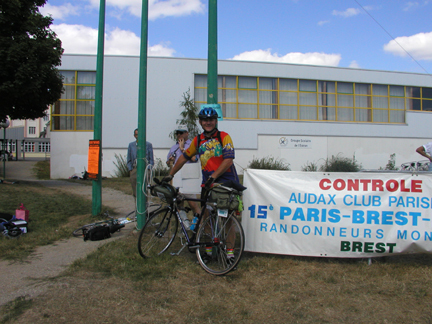 In his Ultra column this year, Mike Seager has been writing about Paris Brest Paris, or PBP. 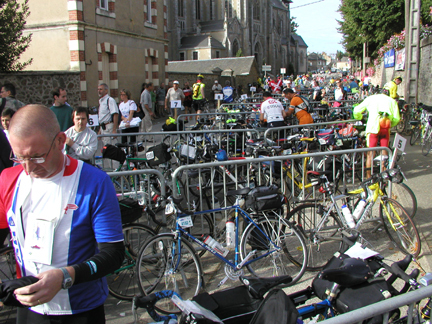 PBP, an approximately 1200km ride, is held in France once every four years, and was held August 18-22 this year. 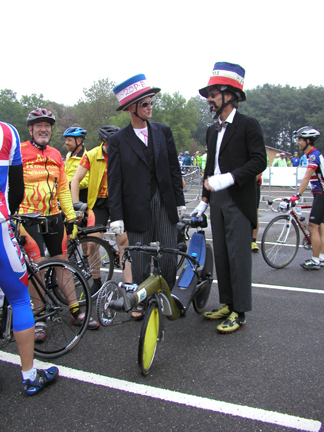 The event has been run since 1891, and is one of the oldest cycling events in the world. This year four members of the RBC, Michelle Dulieu, Mike Seager, Mark Frank, and Pete Dusel participated in PBP. The route is basically an out and back starting in St Quentin en Yvelines, a Paris suburb, to the port city of Brest and back. 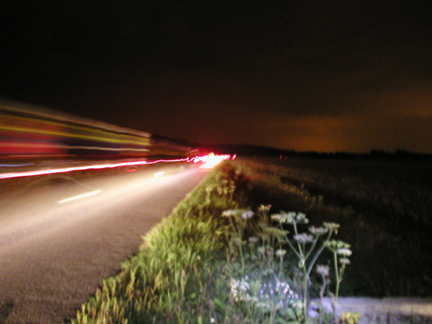 Checkpoints, after the first 115 miles, are located about every 50 miles along the route. 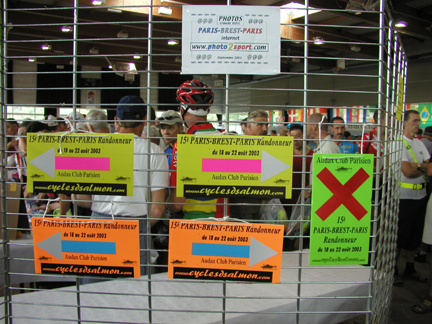 At the checkpoints, known as Contr�les, volunteers stamp the rider�s route card. Cafeteria food, the Red Cross and mechanical assistance are also available. Many of the contr�les have showers and sleeping cots available. 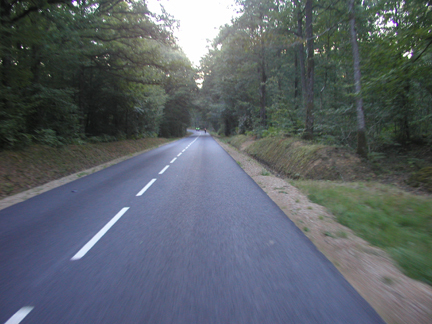 The ride is through the French countryside, primarily on two lane roads, and is very reminiscent of the Finger Lakes, primarily rural, rolling terrain, mostly agricultural, but without the lakes or the steep hills. Nowhere is the route flat, but nowhere on the ride did I feel the need to use my granny ring, and I�m a big fan of granny gears! The steepest hill is not as steep as County Road 12 coming out of Naples. There where about 4,200 entrants for this years event, and most of them seemed to be in front of us at the 10 PM start! The line ahead of us at the start, more behind us! There where many unusual machines in PBP, including many varieties of recumbents, racing tricycles, tandems, a triple, and even a Finn on a kick scooter! 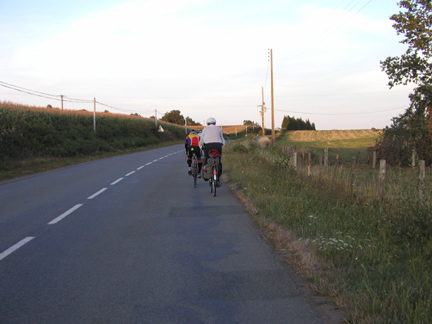 Cycling in Brittany is a very different experience than cycling in the US. The drivers patiently wait for a safe spot to pass, the people are encouraging and we never saw a pothole. 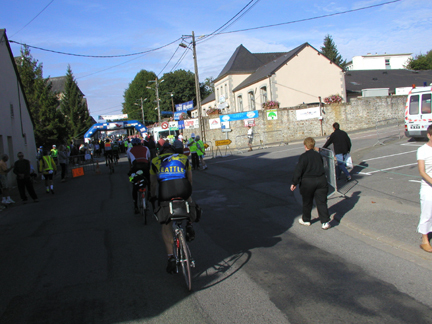 As an example, at many intersections, locals were stopping cross traffic and waving the cyclists through. At one of these, at the top of a small rise, Mike and Michelle where waved through. At the same time a bystander accidentally walked into the intersection. Rather than risk hitting her, Mike and Michelle both stopped quickly and did the "fall over in clipless pedals" routine. 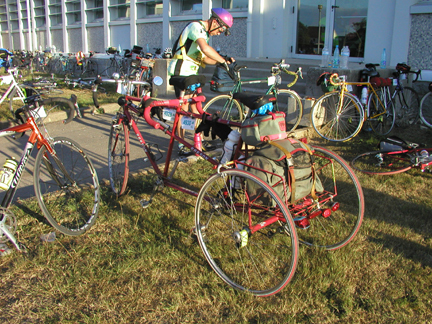 Within seconds they where surrounded by apologizing Frenchmen, who unclipped them, checked their bikes, gave the wheels a spin to check for true, reseated them, and a push start down the road! Can you imagine the average person in the US even knowing how to unclip you? Pete in Brest! Halfway, only another 380 miles to go! In one small town, in late evening, I stopped to make a slight adjustment, and a young girl came up to me, timidly holding out a pen and a pad. She had but one question, "Autographe s�il vous plait?" I have never been so flattered in all my life! Someone asking ME for an autograph? But of course I signed her pad! She went away ecstatic. 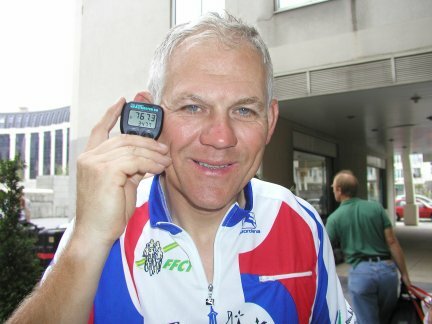 You�d think I was Lance winning his fifth tour! That sentiment is echoed along the entire route, where anytime of the day or night we were likely to be greeted by applauding French shouting "Bonne route, Bonne courage, Bonne chance! ", good roads/courage/luck. Despite rumors, the French greeted us everywhere with open arms. Many people spoke some English, and a few hours with French tapes from the library, and a phrase book where enough to get by. Any less would have been rude on our part. In Gorron, a small town, the towns' people set up a courtesy booth, handing out fruit, water and Coke to the participants. Many people along the route do the same from their homes. 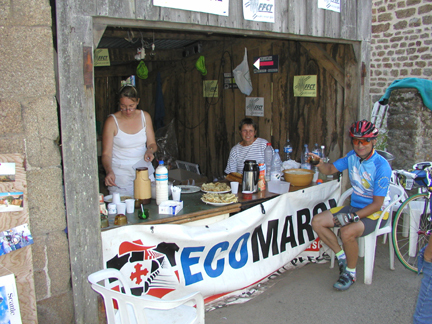 In Tanniere, people had converted a garage into an impromptu refreshment stand with coffee, hot chocolate, rice pudding and crepes. The only compensation they�d accept, was a postcard sent from your home. Adding to the feeling of being treated like a pro, commercial photographers where stationed at several places along the route, and a commercial video is being produced. The commercial photos may be viewed, and ordered, online. The link is at the end of this article. The ride was very much like a huge RBC ride, with people forming groups going at the same pace. One of the things that makes it so interesting is you end up in groups of assorted nationalities, with assorted languages, all talking cycling, the weather and the usual cycling things, but with a Spanish, French, Australian or perhaps Japanese twist. And with so many participants, there is always a group to join going your speed. Although there is adequate support along the route, and many people choose to do PBP on their own, Mike, Michelle and I where VERY fortunate to have Mike�s sister, Marcia, provide us with some "on the road" support. Marcia used a rental car to meet us at several of the contr�les, carrying spare clothes, food and moral support. 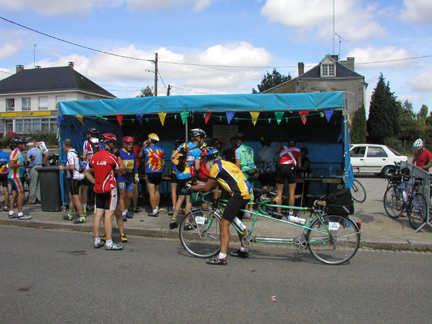 She got to tour some of the French countryside, be a part of the event, and sample the creperies along the route. Mark�s fianc�e, Karen, provided him with similar support. This support is covered by strict rules, and unfortunately, these prevented them from seeing much of the cycling route. PBP is certainly not for the cycling elite, this year there were participants from late teen age, to late 70�s, who came from over 25 countries around the world. I rode with Americans, Brits, Australians, Finns, Canadians, Germans, a Russian fellow in sneakers, and of course, French. 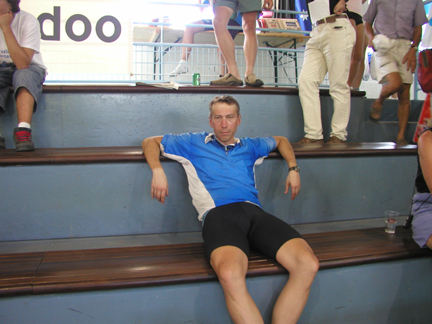 I am no Lance Armstrong. My computer tells me I averaged 13 MPH on the ride. I�m a bit overweight, have high blood pressure, a minor cardiac problem, and am on the wrong side of 50. Although difficult, if you can complete a Finger Lakes century, including county road 12, completing PBP is mostly determination, time management, nutrition, hydration and determination. 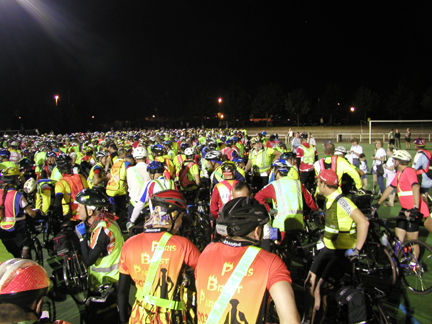 If being part of such a large historic event appeals to you, there is no time like now to start planning for PBP 2007. 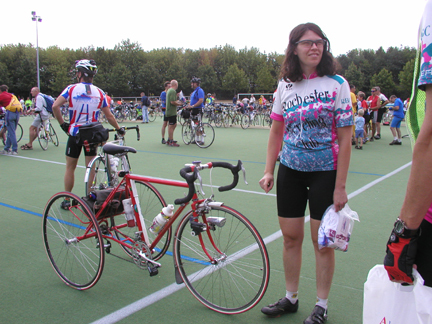 I�m planning a slide show for this winter, and I�ll be hosting brevets in the Rochester area next summer, come out and join us! 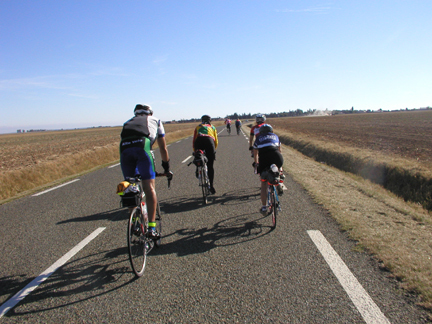 PBP is truly the exceptional cycling experience, which ordinary people can do. Map with elevation profile: http://www.cyclos-cyclotes.org/pbp/index_ang.html under the "Le Parcours" link.